Customers who purchase domestic economy class tickets on or after May 12, 2008, but before June 15, 2008, may check one bag for free and check a second bag for $25 each way. Customers who purchase domestic economy class tickets on or after June 15, 2008 will be charged $15 each way for the first checked bag and $25 each way for the second checked bag. Carry-on luggage remains the same, with one 40-pound bag at no charge. There are some exceptions to the charges, such as travelers who purchase full-fare tickets in economy class and those buying business or first class tickets. A complete list can be found in the American Airlines newsletter. So, book your flights to the Virgin Islands (STT) as soon as possible to keep the cost of your duty-free rum down! The 172-foot motoryacht Big Eagle, is spending her summer in the Pacific Northwest and still has some openings available, July 15-26 and after August 5, 2008. What a way to chill out! 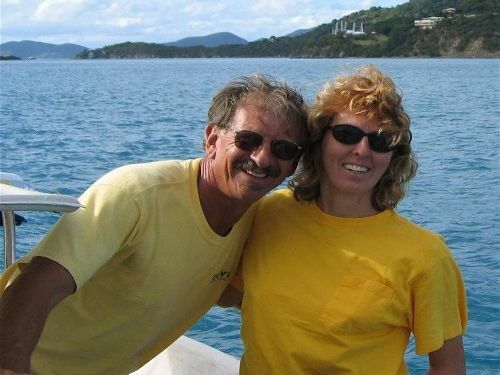 Here are comments we recently received from a couple we had aboard the Charter Yacht STORM PETREL in the Virgin Islands. Our vacation was everything that we had hoped for and more. Storm Petrel was exactly what we were looking for. Captain Phil and Laura made us feel right at home onboard. The boat was clean and comfortable. We were able to use as much water as we wanted throughout the week thanks to the huge tankage on Storm Petrel. Stern showers were frequent with heated water. 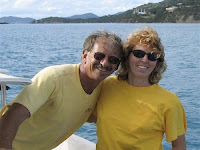 Captain Phil and Laura offered us many options for daily activities and destinations. The food onboard was plentiful and excellent. Laura cooked to our tastes wonderfully. We requested sailing and boat handling instruction during our vacation, and Captain Phil proved to be an excellent instructor. He was positive and encouraging. He never yelled at us. We were doing all the boat handling by the end of the second day. Captain Phil also taught us how to windsurf. Our hosts took us to a variety of great snorkeling spots every day. It pays to be on a boat with people who know the islands like the back of their hands. We went places that bareboats aren’t allowed to go. We were truly sad to say goodbye to our hosts on Storm Petrel. Paradise Connections was very professional throughout the process of booking our vacation. All of our questions were answered in a timely manner, and everything was handled professionally. I do thank you for your services. Paradise Connections is an upstanding company that instilled us with the confidence to pull the trigger on our dream vacation. The resulting vacation was fantastic. Storm Petrel is a Robert's designed, 44-foot Offshore 44 sloop. Phil Levine is the captain and owner of Storm Petrel. His chef/crew is his girlfriend, Laura. Storm Petrel has a queen cabin aft and a V-berth cabin forward. They have an 11-foot dinghy with 15HP motor, windsurfer, hammock, snorkel equipment. Alcoholic beverages are not included in their rates, but will stock with your preferences at cost. GENESIS is a 47-foot Catana Catamaran based in the Grenadines. Genesis, owned and crewed by husband/wife team Petr & Stacy Stejskal, is a very special charter yacht for one couple. The entire starboard hull is dedicated to guests, creating a spacious, private, king-bedded suite with an oversized head and shower. Many hatches and full A/C guarantee comfort year round. Gleaming with fresh Awlgrip and new teak decks, the charter yacht AMNERIS, a 75-foot Alden / Palmer Johnson ketch, has finished her refit and is now available for charter in the Caribbean and will be sailing up north to charter in New England for Summer 2008. Major improvement: Responding to broker input, the master cabin now has an extra wide double bed and an extra wide single bed. Building on AMNERIS’ classic style and strong points – notably her wide decks, huge protected cockpit and spacious main salon - these improvements and added comforts are sure to be appreciated by charterers. The plan is to base in the Grenadines from March through May. Captain Frew looks forward to welcoming you aboard the polished and gleaming AMNERIS! We are pleased to announce a new yacht to the charter fleet... s/y Wanderer, a Little Harbor 62. This elegant 62-foot sailing yacht was refitted in 2005 with luxurious appointments and artwork complimenting the warm glow of the teak interior. Stepping into the spacious salon you find an L-shaped settee to port with a flat screen TV mounted on the bulkhead. To starboard, the polished teak dining table seats six comfortably. The icemaker ensures a steady supply of ice for cocktails while the cockpit fridge keeps cold drinks close at hand. The ensuite master stateroom, with one queen bed and one single bed, is aft and has its own private companionway from the deck as well as access from the salon. The two other guest staterooms are forward of the salon. The queen-bedded starboard cabin has ensuite head and vanity and shares a shower with the crew. The port cabin has upper/lower berths and a full en suite bath with shower. Crew accommodations are forward in the double v-berth with its own head. Wanderer is available for charters in New England this summer (2008).